Long-distance relationships are hard. After all, how can you stay together when you're far apart? This is where Kissenger--the kiss-transmitting robot--comes in. With Kissenger, you can remotely send a kiss to another person with a Kissenger: All you had to do is kiss it. 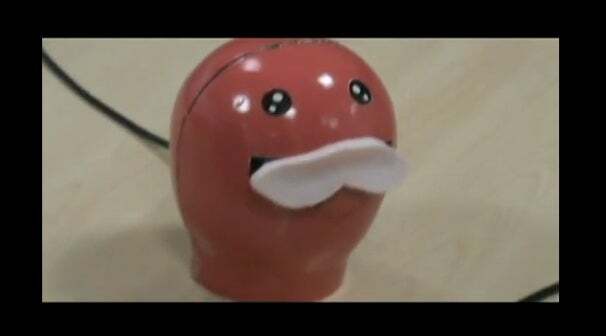 Created to provide a "novel way of transferring a kiss through interactive digital media," the Kissenger works by first capturing the pressure patterns you create with your lips before recreating it, with the help of actuators, on your other half's globular kissing assistant. While the first Kissenger prototype left much to be desired for it was, quite literally, a fat, featureless white egg with a mouth, the most recent incarnation is far easier on the eyes, regardless of its duck-like expression. What's interesting, however, is that the device wasn't just designed to serve as a mediator for remote romances. According to the Lovotics website, the Kissenger can also facilitate two other modes of interaction as well: human-to-robot kissing and human-to-virtual character physical/virtual kissing. Nope. I'm not even going to begin contemplating on the possible implications of this. When all is said and done, however, it could be worse. Kissenger is still significantly more appealing compared to the Kiss Transmission Device, an invention that's more akin to a Breathalyzer.